Many years ago a friend suggested that when I couldn’t find something, I ask God to show me where it was. When she did this, she could see where it was in her mind’s eye. But I didn’t try it because she had such a “hotline to God” and well, I didn’t! A few years ago I began hearing the same thing from people through whom God worked through regularly to heal others (in private, not on stage; my memory says it was Agnes Sanford, Bill Vaswig and Dallas Willard, but I can’t find the documentation.) The location of the item is in our mind anyway, so we simply ask God to help us locate it in our memory. As I began doing this I found I had a greater sense of “dependence upon the hand of God in a ‘with God’ life” (DW). I wasn’t using God to make my life convenient (as prayer is often used), but I was cultivating an increased partnership with God in all of life. 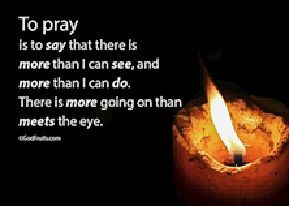 Prayer is, after all, “talking to God about what we are doing together.” (p. 243 Divine Conspiracy). Since these prayers occur in the midst of everyday life, we find ourselves beginning to count on God for everything in life. Yet the following situation still surprised me. I buy and store 6 candles at a time to use individually when I do spiritual direction. Storing them in my garage didn’t work because they melted, so I searched for a new storage space. I decided to store them near the coffee table in my living room where I do direction. I tried to fit them under the sofa – but that’s where I store paintings. The piano bench was full. Eventually I found a very good place and put them there. But where? I needed a new candle and had looked under the sofa and so on. Nothing. I asked God for help but nothing came to me for a week. Finally I sat down with a directee with only a stub of the last candle. I told him my dilemma and we laughed. We began in our usual way: I light the candle and say, “This is to remind us that we are two people listening together to the Holy Spirit”; we are quiet together for a few minutes; I pray a short audible prayer asking for God’s help. I lit the candle and spoke; then as soon as we both shut our eyes to be quiet, I saw exactly where the candles were. I wanted to jump up and cheer but I steadied myself and remained quiet. Then after I prayed aloud, I told my directee that I knew where they were. I walked over to the hall closet, reached toward the far left corner and pulled out one of six candles. SO WHAT? Why tell you this story? Small, even trivial, moments with God are important because there is the possibility (even likelihood) of becoming a practical atheist: believing the right things (even quoting Scripture), going to church, and serving Christ at appointed times, but one’s real practical every day existence is disassociated from God. Christ invites us into an interactive life with God, in whom we live and move and have our being here and now (John 17:3 “know” means relational interaction). This life “in Christ” means we are Christ’s partners in our daily work and relationships. We are loved and provided for, and so we gladly live in Jesus’s words: “You are always with me; everything I have is yours” (Luke 15:32, father speaking to older son). Why would we want to live any other way? Experience formation in an 18 month journey of studying and actually practicing formation with others in the Apprentice Experience. I’m blessed to be on this team of teachers!